Because photos are such an essential part of our lives and usually displayed in our homes, it’s nice to have them framed in more than just your typical picture frame from the store like every other family home in America. Giving your photos a unique frame not only is a nice way to display your memories but it also helps tell the story behind them—which is the most important part. Here are 13 cool and crafty ideas to frame your photos in a unique way. Then after your creative juices are flowing, head over to our professional quality photo prints to print your pictures! Decorate your wall with vintage hand mirror picture frames. You can order vintage mirrors online or just visit your local secondhand or antique shop. Replace the mirror with a picture of your choice, cutting the photo into the round or oval shape of the mirror frame. You’ll be left with a unique frame and something really cool to hang on your walls. Plus, who can have too many mirrors? Another great vintage frame idea is collecting old purses and gluing your photos onto the front of them. The vintage style clutch with an attached hand strap is perfect for hanging on your wall as they are small and lay flat. After you’ve pasted your photo on the front of the clutch, open the purse slightly and fill it with dried flowers, giving them not only the purpose of a unique picture frame but also for decorative wall art. These may sound silly and gaudy even, but they are extremely beautiful and tasteful. Just give them a try, you may surprise yourself with what looks good, and what you like. With a wooden frame from a craft store and some twigs that you pick up along your morning stroll, you can create a rustic photo frame to hang on your wall. Coating your wooden frame with a layer of rubber cement, place your twigs onto the frame stacking them in a log cabin type of way or whatever looks creative to you. Attach some moss and flowers on the corner to give it a more elegant look. These kinds of frames are great because you can really make them fit your style. Think of all the kinds of sticks and twigs that can be used to display your crafty side on your walls at home. A perfect frame to display your most recent beach vacation is simply a plain wooden frame and some beach rocks, pebbles, or shells. Individually glue each item onto the frame, placing them in a design or filling the frame entirely. This will give your frame some texture and color, and a unique, uneven edge from all the misshaped rocks surrounding it. Not only do these frames look great, but they add to the photo and help you recall the memories surrounding the photo, and the entire trip. None of these will ever look exactly the same, and that is one of the best parts. A fun DIY frame idea for the kids is a popsicle stick frame. With acrylic paint, paint the sticks colors of your choice, or with some paint pens, you can draw out designs onto the popsicle sticks. Arrange them in a number sign format and glue your photo onto the back so you can’t see your pictures edges. You can also glue your popsicle sticks side by side so they dry into a solid board, giving you the surface area to simply paste your picture on top of it. This is a fun activity to accomplish with your kids! These are enjoyable for the whole family, but actually look really good on the wall. Because they are flatter than ordinary frames, it gives a different and fun look to your home. Using the circular lids from your mason jars, simply cut a photo to match the lid size and paste it onto the inside of the lid so that it creates a raised frame around your photo. With a glue gun, fasten a magnet on the other side of the lid and you’ll have a quick and easy DIY magnet photo for your fridge! A creative way to frame multiple photos in one large frame is to use a piece of chicken wire. Find a frame and take out the glass and backing to it, leaving the frame to stand alone. Stretch a section of chicken wire across the frame, securing it by stapling it to the back. The wire should be taut and flat so it can lay nicely against a wall. 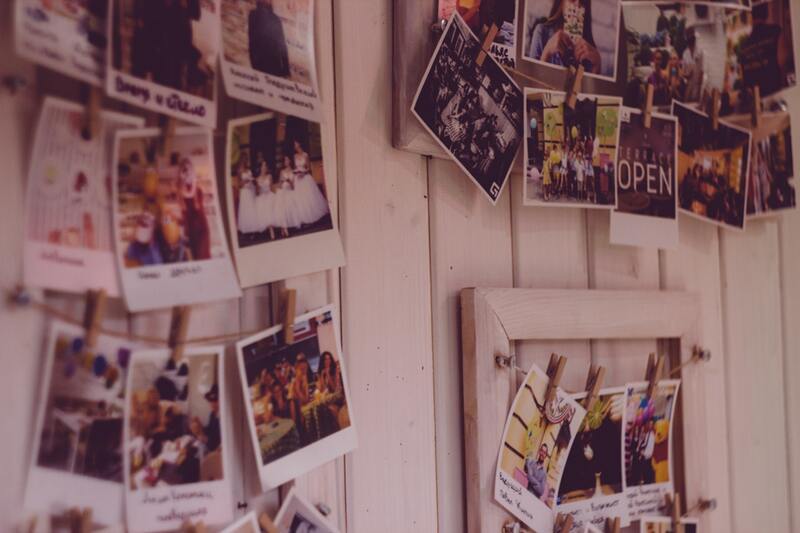 Pick out multiple photos and clip them onto the chicken wire with mini clothespins. This is a great frame idea for a child’s bedroom or a playroom—places where you cannot simply decide on just one photo. For some people, losing their car keys is a common theme in life. When you come home, have a designated section on your wall to hang your keys so you’ll always know where they’re at. But instead of just putting boring hooks into your wall, frame your hooks as well! Pick up a small frame from a craft store that you can paint or decorate in any way you chose. Once your frame is decorated, screw tiny hooks into the upper edge of your frame so they hang down. Mount your frame next to your front door and hang up your keys. Not only will you always know where to find your keys, but you’ll also have a cute frame to surround them and add some character to your home. As a bonus, use some chicken wire to also hang a few photos to go with your keys. A great framing idea for photos is using an old pair of sunglasses. Carefully trace the lens of your sunglasses onto the photos that you’re using for each lens. Once you have cut the photos to fit the lens, gently glue them behind the lenses and seal them with hot glue. Your sunglass lenses should act like the glass of a picture frame. This is a cute idea for a nursery room or just as added decoration to your living room. You can also buy those giant and silly sunglasses to fit larger photos and have a little more fun with it. Using an old French door is a great way to display your photos and cover up large empty wall space. The door is ready for photos since the glass is already gridded. Print out photos to match the individual squares in the door and with hot glue, paste them smoothly in each grid. Once dried, mount the door to your wall either horizontally or vertically, whichever way fills your wall space evenly. Add a few hooks for your keys and coats too! This will give your home a rustic look and is also a great way to repurpose an unused door! They are cheap to buy at second-hand or antique stores and add a completely unique look to your home that will most definitely stand out. A great way to utilize your photos and make them useful in your home is by framing them and turning them into bookends. If you’re creating bookends for your child’s bedroom, choose photos of your kids playing at school or even their school portrait. Or, if you’re creating them for your home library, choose family pictures or your wedding photos to use as your bookends. Frame them in a sturdy, heavier frame that will be able to withstand the books that they’ll be holding. Framed photos often get used as bookends accidentally anyway, so you may as well set them up that way and make it work even better. What a unique way to create custom bookends and have one more reason to show off your favorite photos in your home! If you’re about to remodel your home with some new tile, like black splash for your kitchen, tile in your shower, or a tiled outdoor BBQ area, consider turning some of those tiles into picture frames! For example, if you’re tiling a wall in your bathroom, cut out a small rectangle or square in one of your tile pieces and fill it with a photo of your kids playing in the ocean. You can offset the place for your photo by cutting out a piece in the bottom right or left-hand corner. It doesn’t always have to be in the center of the tile. This will give the “frame” a unique and geometrical look. It’s a different and more permanent way to display photos in your home. Get smart with your picture frames by creating large scrabble letters out of wooden squares and black paint. Hang a photo on your wall with a simple, black frame and then line the frame with a “scrabble word”. For example, if you’re hanging a wedding photo, on one side of the frame, attach the letters L O V E down or across one side of it. This is a fun project that’s easy and creative. Just paint on letters of your choice that will create words that go along with your picture. The ideas for these are endless and work with all kinds of photos, just find the right word.